Judith Landing, a recreation area located Upper Missouri National Wild and Scenic River in Montana, has a long history of early exploration. Corps of Discovery Campsite, May 28, 1805. Lewis’ dog saved his and Clark’s lives when a frightened bull buffalo almost ran them over as they slept. Fort Chardon Trading Post, 1844-1845. Third fur trading post established by the American Fur Company along the Upper Missouri River after the massacre of Blackfoot Indians and the burning of Fort McKenzie. Blackfoot-Flathead Council of 1846 and Isaac Stevens “Lame Bull” Treaty of 1855, where lodges of more than 15,000 Indians were camped. Camp Cooke, 1866-1870. The first military post to protect the steamboat trade. PN Cable Ferry, 1880-1908. Reportedly, cable ends still remain in the river banks. Ferdinand Hayden, 1855. Hayden uncovered and collected several specimens of fossilized dinosaur bones and teeth. His discoveries constituted the first identified dinosaur skeletal remains in the Western Hemisphere. 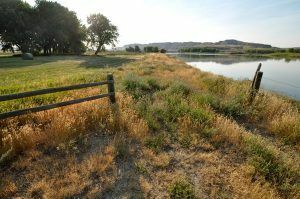 On the south side of the river at Judith Landing, the entire river bottom was once part of a large, open-range cattle spread founded by T.C. Power, merchant prince of Fort Benton, and John Norris, who managed the ranch for the company. Today, the recreation area, managed by the Bureau of Land Management, provides a campground and is a common take-out point for many boaters along the Missouri River. Judith Landing is located on Montana Highway 236, where the highway crosses the Missouri River, 44 miles south of Big Sandy and 23 miles north of Winifred.